Straits State Park is a popular St. Ignace area campground located only 8.6 miles from the facilities of Mackinaw Mill Creek Camping in Mackinaw City, MI. Established in 1924, Straits State Park is home to the Father Marquette Memorial. Straits State Park offers 270 campsites on 181 acres overlooking Lake Huron and the Straits of Mackinac. Camping styles vary widely and many State Parks may not be a good fit for some campers. Straits State Park varies in their accommodations, features and facilities compared to Mackinaw Mill Creek Camping, so we have gathered information on Straits State Park and contrasted them with Mackinaw Mill Creek Camping. 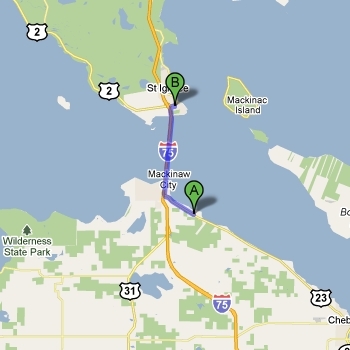 The chart below compares Straits State Park versus Mackinaw Mill Creek Camping. Dozens of site types Straits State Park offers 270 campsites, some with electrical service. 200 Full Hookup Sites Limited sites with 50 amp service. Variety of Lakefront Cabin Rentals Mini cabins available.